1940-1945, Columbia. A Colombian Air Force North American T-6 Texan patrols Colombia's Caribbean coastline. Photo from Wikipedia. Colombia was an ally to the United States even before the Pearl Harbor Attack on December 7 1941. Although not at war with the Axis yet, German U-boats often entered the country's national waters, unwanted. Tensions rose steadily until June 23 1942, when German U-boat sank the Colombian schooner "Resolute" 50 miles northwest of San Andres. Five days earlier, the "Resolute" rescued 23 British Royal Navy sailors and a few Marine officers from a capsized ship, which was 200 miles north of Cartagena. Following this incident, the Colombian government decided it was time for more patrols in it's Pacific and Caribbean coasts. 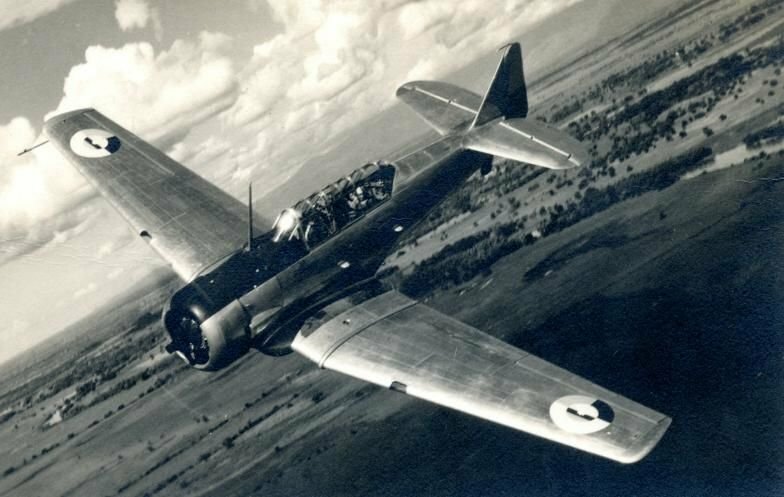 It was decided that one fighter squadron and a combat recon squadron, each made out of Curtiss F-8F Falcons, were to be moved from the Palanquero Air Base to Barranquilla. In 1943, the F-8 Falcons were replaced by the AT-6 Texans and the squadrons were used until 1945. The first AT-6 Texans were brought in 1940, along with some Pt-17 Stearman biplanes, only the Texan was used in missions.